Hog Heaven: Lady (and gentleman) hoggers Christine Chreene, Gary Stamper, and Julie Snead pose over fresh prey. Stamper's beloved hoggin' hound Poacher was saved by an Auburn-trained vet in a recent episode of A&E's "Lady Hoggers." Sure, Auburn gets ribbed for its rich heritage of aggin’ and vettin’, but next time someone dusts off a “cow college” joke, just remind them— if it weren’t for Auburn, Poacher would likely be dead, gored into doggy heaven, and A&E’s hogsploitation homage to Russ Meyers might be cancelled. “When he came in here, his intestines were layin’ out on on the pick up truck,” Dr. Lee Shewmaker told us this morning. Shewmaker was on his cell phone, driving down a stretch of highway near his vet practice in LaBelle, Florida that was recently staked with a “hog crossing” sign. He’s speaking of Poacher, the beloved hound whose hog-caused hospitalization took up the last half of the most recent episode of the A&E’s Florida-based reality series Lady Hoggers. 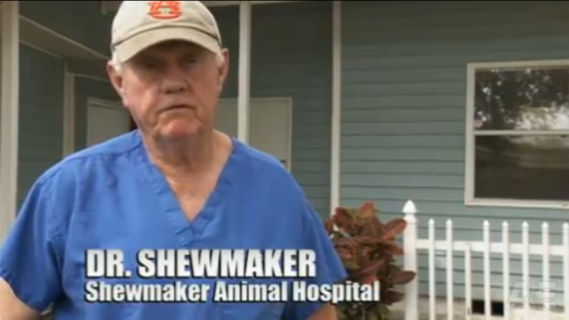 Shewmaker, a 1969 Auburn Vet School graduate, sewed him up. When he discharged him to his owner, gentleman hogger Gary Stamper, he was wearing his Auburn hat. A lot of dogs wouldn’t have made it. Thankfully, Poacher beat the beastly odds. Auburn hats are becoming almost common place in “extreme job-related, boy-don’t-these-folks-talk-funny reality shows.” Captain Bullfrog from The History Channel’s Big Shrimpin’ also pulls for the Tigers. Eagle Eye Award to Sue Ann Raybon. Ha! I knew who it was before I clicked the link! La Belle is my hometown. He goes by Lee, though. War Eagle!